All natural ingredients.If you love the idea of green tea, but also like the sweeter side of life, these deliciously indulgent teas will be perfect for you. What does it taste like? Salted Caramel is a wonderful contradiction of sweet and salty which is rich and smooth. 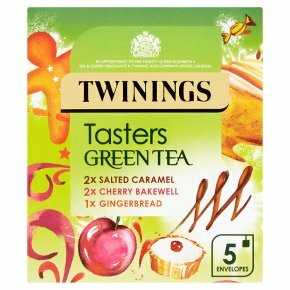 The tangy ginger and golden syrup flavours in our Gingerbread green tea will remind you of your favourite cake shop, while the English classic Cherry Bakewell Tart is the inspiration behind the sweet cherry and almond flavour combination. How do I drink it? We suggest brewing these delicious teas for a maximum of 2 minutes, any longer and you'll lose the delicate taste. Allow one bag per person and add freshly boiled water. These delicious green teas are best without milk.